Vitamin C is proven to be an effective ingredient for minimizing pores and reducing hyperpigmentation, but when it’s exposed to air it loses its effectiveness. 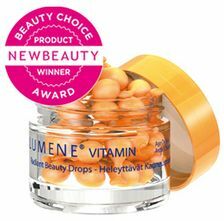 Lumene has found a way to overcome this problem by putting daily doses in tiny capsules in jar. Not only do these ‘drops’ have a vitamin C, they also have moisturizing plant sterols and antioxidants. You get a 28 day supply, which is enough to see a huge difference. In terms of skin texture and even tone, this is the greatest product we’ve tried. If you put it on at night, you’ll see the difference in the morning. And although we loved the matte texture it gave our skin, we don’t recommend you wear this during the day. Vitamin C makes your skin more sensitive to sunlight, so putting it on at night is best. And you’ll also want to be sure to use a sunscreen. This product reminds us of Estee Lauder’s Idealist, which is one of their best sellers. Lumene suggests you use the product over the course of 28 days. However, we think it’s also a good idea to just use a capsule at night whenever you want your skin to look great the next day. For more product reviews on skincare items, click here.